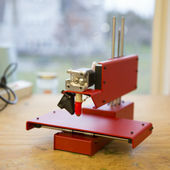 Printrbot has released an injection molded plastic v2 extruder that is a bolt in replacement for the Play and Plus. This adapter is a printable file for Simple users. The holes to mount this to the metal extruder arm don't line up on my Red PB Simple Metal. Are there different mounting holes for different bots?